We finally turned our clocks forward this weekend in the UK, which is great. But somehow, it’s still winter. And will probably continue to be winter until around June. In fact, winter is the only season you can 100% count on here in this pretty little grey damp island. There’s winter, a little phase of summer, then a little winter, maybe some autumn with some funky colored leaves, then a little bit of winter, then a whole lot of winter. Repeat. I won’t even pretend Spring makes an appearance. This is a good point to interject in my own rambling to say I absolutely love the UK and I don’t care that its weather is atrocious. Now having said that little bit about winter, the thing about the cold lasting longer than usual is that you want rich, comforting foods to eat throughout – when it is bone-chillingly cold and you just need some food TLC. In October, I went to Rome with my good friend Elsy, and we went to this great restaurant called Roscioli where I ate the best spaghetti carbonara I have ever had in my life – not bad for 15 Euros. If you’re ever in Rome, please go to this restaurant. It’s delicious. 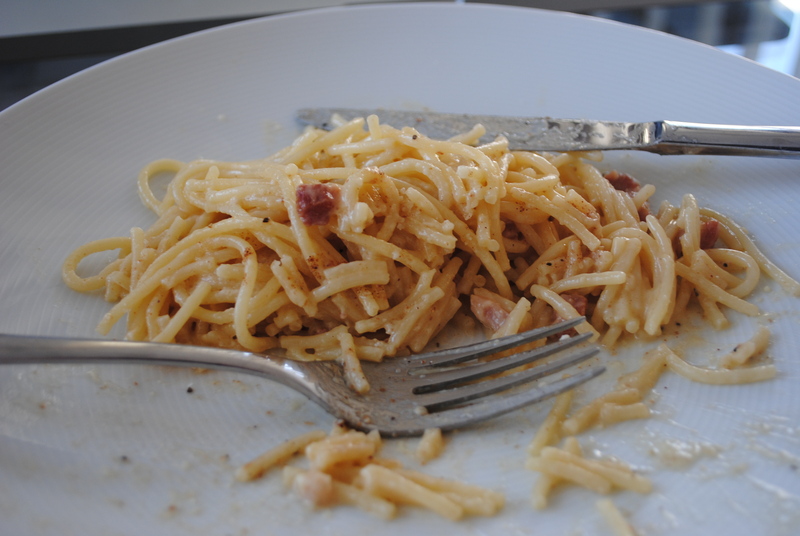 Now what was most amazing about this particular spaghetti carbonara was not its rich creaminess (although that was pretty awesome too), it was the guanciale, a special spiced Italian bacon. It had the amazing flavor of regular streaky bacon but was a hundred times more potent, crisp and yet was not chewy in the slightest and sort of melted on the tongue. Heavenly. However, if you’re just slumming it with this recipe like I was, you can use pancetta or lardons. I will admit, it will not achieve the amazingness that you could if guanciale was in your pan, but you will still get a delicious Italian classic out of this. Anyway, enough ranting about the deliciousness of bacon. Put a large pan of salted water on to boil for the pasta. Cut the pancetta into 1 x 1.5cm cubes or buy pre-diced pieces. If the pancetta has its rind on, cut it off – and use a bigger piece of pancetta, as the amount I’ve specified is for the prepared cubes. If you buy pre-diced pancetta or lardons it will most likely have the rind off so don’t worry too much. 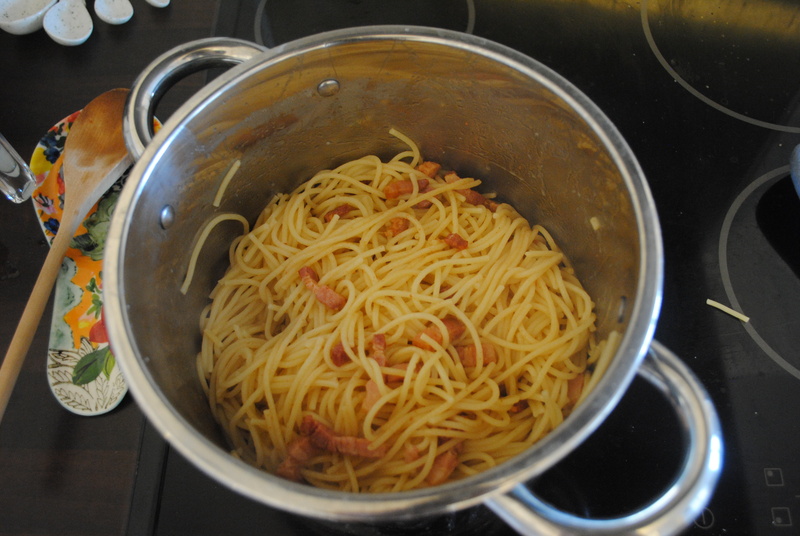 Then in a large pan that will fit the pasta later, cook the pancetta cubes in the oil until crispy but not crunchy. I actually used a pot here because the pan I have is too small to accommodate all that pasta, but it will works. I personally like the lardons very crispy so I have probably over-cooked them a little bit but that’s just personal preference. Throw in the white wine and let it bubble away so that, after a few minutes, you have a small amount of salty winey syrup left. Remove the pan from the heat. Cook the pasta more or less according to the packet instructions, but since you want it kept al dente start checking it 2 minutes before the instructions say it’s done. 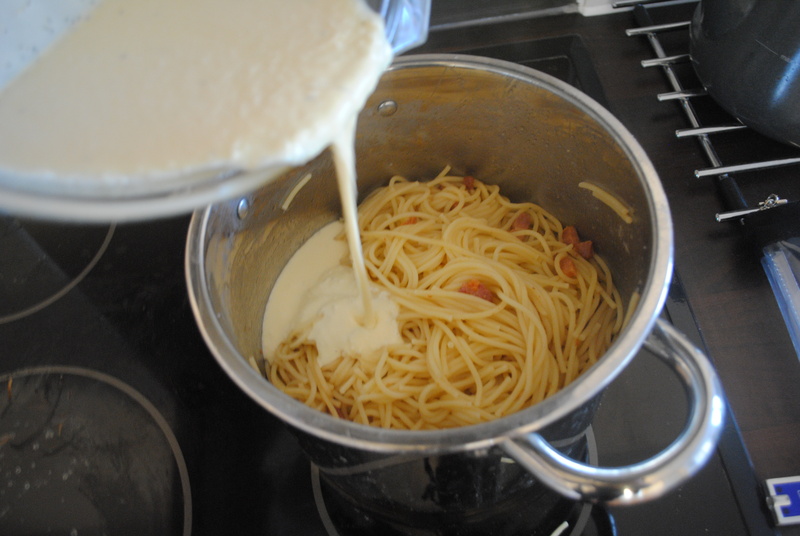 Use a measuring cup and remove approximately 125ml of the pasta water before draining and set aside. 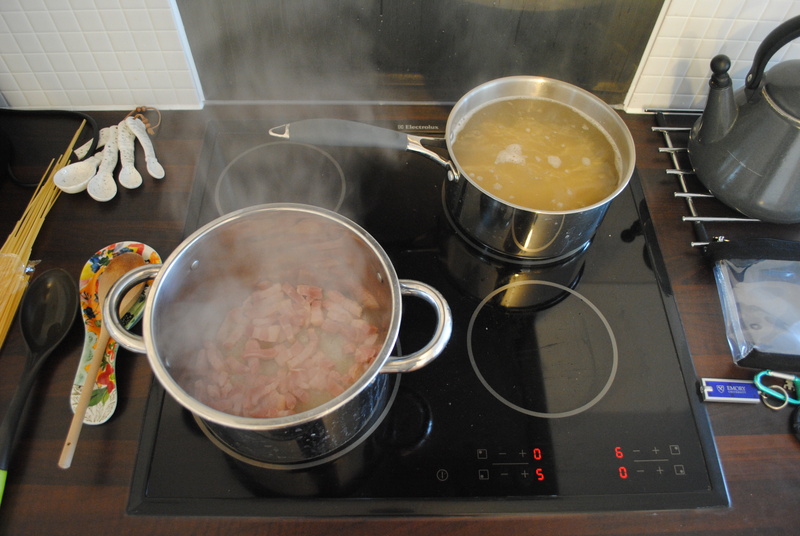 Put the pan with the bacon cubes and wine back on the heat and add in the drained pasta, tossing well. 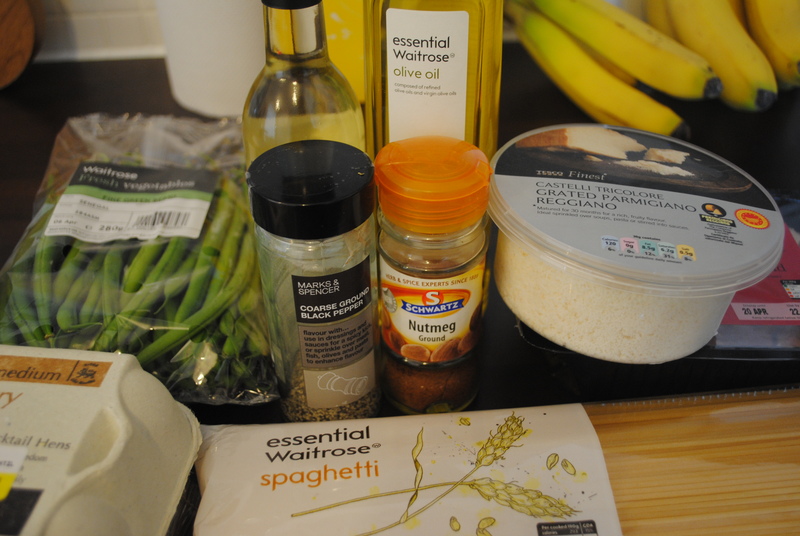 Add a little of the pasta water you put aside to lubricate if necessary. 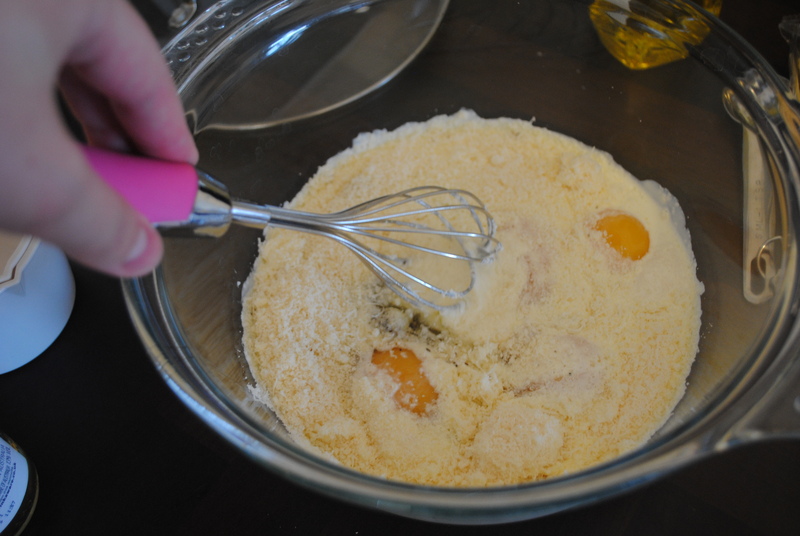 Take the pan off the heat again and add the eggs and cheese mixture, swiftly tossing to mix everything nice and evenly. Grind over some more pepper and grate over the nutmeg if you want to put that on. Gorge. (I mean that as a verb). 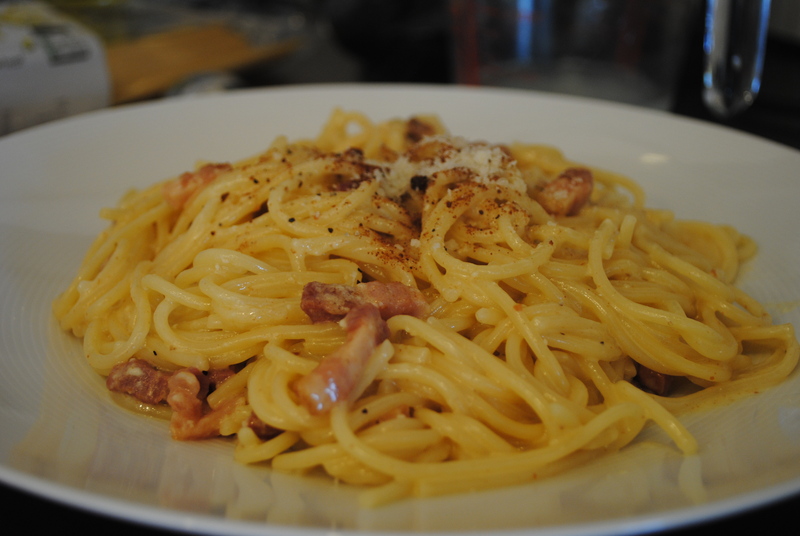 Posted in Home CookingTagged Carbonara, Guanciale, Home CookingBookmark the permalink.